Located just a short ferry ride from the resort, Isla Mujeres is a stunning island with quiet villages and beautiful views that make for a great excursion from Cancun. 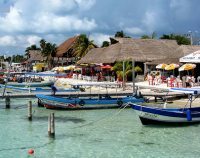 The calm atmosphere is a relaxing break from the bustle of Cancun's busy beaches, and Isla Mujeres offers some excellent restaurants serving freshly-caught seafood. Hidalgo Street in El Centro is the main dining, shopping and entertainment area. Popular activities on Isla Mujeres include lounging on the pretty beaches, swimming with dolphins, snorkelling and scuba diving, exploring the remarkable Underwater Sculpture Museum, swimming with sharks, deep-sea fishing, and kayaking. The most popular beaches are on the north and west sides of Isla. Transport: Regular ferries are available from Puerto Juárez or Gran Puerto on the mainland.